What can Team Penske do for an encore following what was possibly the best season in the 53-year history of the organization in 2018? It remains to be seen if Team Penske can raise the bar even higher in 2019, but with winning teams and drivers forging championship contenders in all five series where the team competes, it is destined to be another season to remember. Across each level of competition, the individual Team Penske teams remain mostly intact for the 2019 season as the organization will race to win in the Monster Energy NASCAR Cup Series, the NASCAR XFINITY Series, the NTT IndyCar Series, the IMSA WeatherTech SportsCar Championship and the Virgin Australia Supercars Championship. In the Monster Energy NASCAR Cup Series (MENCS), Joey Logano will look to defend his championship in 2019, but he will face fierce competition from drivers throughout the series – including his own teammates Brad Keselowski and Ryan Blaney. 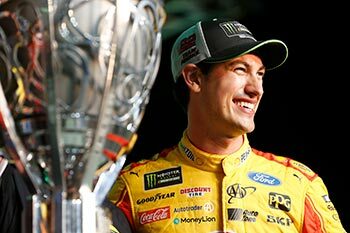 Logano had a dream 2018 season as he produced the second MENCS championship in the history of Team Penske. Crew chief Todd Gordon returns to lead the No. 22 Ford team this season as he'll work with Logano to adapt to the new Mustang while building on the success of last season. Shell-Pennzoil will continue as the primary sponsor of the No. 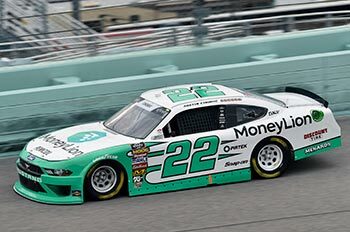 22 Mustang, along with AAA/Automobile Club of Southern California and Autotrader as Logano fights to defend his crown in his seventh season with Team Penske. After falling just short of a second consecutive Championship 4 Playoffs run in 2018. Keselowski will be focused on securing his second MENCS title in his 11th season with Team Penske. Keselowski and No. 2 Ford team crew chief Paul Wolfe form one of the most successful combinations in NASCAR and they welcome back Discount Tire and Miller Lite as primary sponsors for the new Ford Mustang, along with Wurth, Alliance Truck Parts, Autotrader, REESE/Draw-Tite, Wabash and Snap-on. Blaney had a successful first MENCS season with Team Penske in 2018 as he raced his way into the Playoffs and produced a postseason victory before ending the season ranked 10th in the championship standings. With Jeremy Bullins back on board as crew chief, Blaney hopes to take it to the next level in 2019 driving the No. 12 Menards/PPG/DEX Imaging/BODYARMOR/REV Group/VF Wrangler/MoneyLion/Wabash National Ford Mustang. Austin Cindric will race the full NASCAR XFINITY Series (NXS) season with Team Penske in 2019, after a strong rookie season in the series. Cindric competed with three different NXS teams in 2018 – including a Playoff push with the No. 22 Team Penske Ford team. Running the full season with Team Penske and working with crew chief Brian Wilson will give Cindric the consistency and opportunity to compete for the NXS championship and try to secure a fifth Owner title for Roger Penske while driving the No. 22 MoneyLion/Discount Tire Ford Mustang. A second entry for the team will be driven by Paul Menard, Keselowski, Logano and Blaney at select NXS events this season featuring the No. 12 Discount Tire/REV/Fitzgerald/Snap-on/PPG/Menards Ford Mustang. 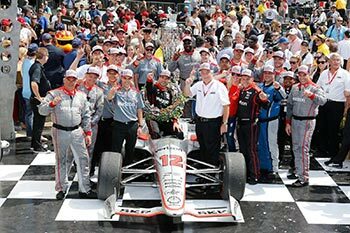 In the NTT IndyCar Series (NIS), Team Penske will be focused on reclaiming the series title in 2019 behind the efforts of three former champions in Will Power, Josef Newgarden and Simon Pagenaud. Power earned the biggest win of his career last season when he was crowned Indianapolis 500 champion. The 2014 series titleholder will continue to work with race engineer Dave Faustino this season on the No. 12 Verizon Dallara/Chevrolet team, and the duo will try to improve on the three wins and four pole positions that led Power to a third-place finish in the 2018 NIS championship. Newgarden posted three wins and four poles last season as he finished fifth in the standings to fall just short of his goal to defend the title from 2017. Newgarden will transition from the champion's No. 1 back to the No. 2 Hitachi Dallara/Chevrolet for the 2019 season. Newgarden and race engineer Gavin Ward will be on a mission to get back to the top of the NTT IndyCar Series mountain this season. Pagenaud is coming off a solid 2018 season but he is anxious to return to Victory Lane and regain his title-winning form from 2016. It took Pagenaud a few races to get comfortable with the Universal Aero Kit car last season but he and race engineer Ben Bretzman found their groove in the second half of the season as they finished inside the top 10 over the final 10 races of 2018. Pagenaud, Bretzman and the team hope to come out of the gate strong with the No. 22 Menards/DXC Technology Dallara/Chevrolet as they try to win their second title with Team Penske in 2019. A familiar face to the Team Penske INDYCAR lineup will also be back for the month of May as longtime team standout Helio Castroneves will race the No. 3 Dallara/Chevrolet at both the INDYCAR Grand Prix of Indianapolis as well as the Indy 500. 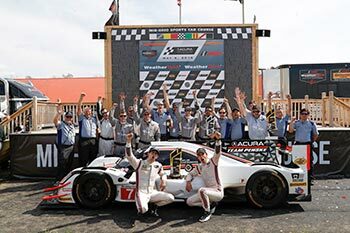 Partnering with Acura, Team Penske returned to sports car competition in 2018 and the team has high hopes of competing for the IMSA WeatherTech SportsCar Championship title this season, with a year of seasoning under its belt and one of the strongest driver lineups in racing. Acura Team Penske returns with a two-car ARX-05 DPi program that features former sports car and INDYCAR champions, as well as Indy 500 winners, on its talented roster. Castroneves, a three-time Indy 500 champ, and former IMSA Prototype titlewinner Ricky Taylor combined for the team’s first win last season when they took the checkered flag at Mid-Ohio. Both Castroneves and Taylor return to the No. 7 Acura Team Penske DPi in 2019 while 2016 Indy 500 winner Alexander Rossi joins the team for this season’s endurance races. Raul Prados continues to serve as the race engineer on the No. 7 Acura. Two-time Indy 500 winner and former INDYCAR champion Juan Pablo Montoya teamed up with two-time IMSA champ Dane Cameron last season in the No. 6 Acura Team Penske ARX-05 and the duo produced four podium finishes and two poles while finishing fifth in the Prototype class. Montoya and Cameron return in 2019 with a focus on fighting for the series title, while Pagenaud – a former sports car champion himself – is back racing with the No. 6 team for this season’s endurance events. Jonathan Diuguid returns as the race engineer to lead the No. 6 Acura DPi in 2019. 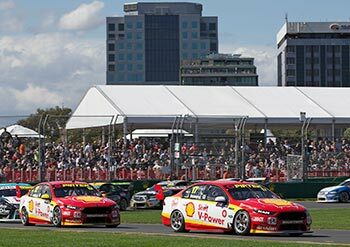 DJR Team Penske won the Virgin Australia Supercars Championship in 2018 with driver Scott McLaughlin and it was a productive season overall for the team with a combined 10 victories, 24 podium finishes and 13 pole positions between McLaughlin and Fabian Coulthard. Fresh off his first series title, McLaughlin will face a new challenge in 2019 as he, crew chief Ludo Lacroix and the No. 17 Shell-Power team will look to defend their crown while racing the new Ford Mustang. Coulthard returns to the No. 12 Shell V-Power Ford Mustang this season and both he and crew chief Mark Fenning will aim to improve on a ninth-place championship finish from last season. Team Penske is well positioned to add to its winning tradition and legacy in 2019 as the organization is prepared to race for wins and fight for championships across all levels of competition this season.